Clout Theatre are experts in the grotesque. In the first show of theirs that I saw, The Various Lives of Infinite Nullity, they took morbid curiosity into new territory, setting grisly murders and suicides on repeat. The company’s earlier show How a Man Crumbled, back as part of the Mimetic Festival, puts the emphasis on the absurd but with the same relish for the monstrous and distorted. Limbs are twisted into alien shapes; arms pop out from suitcases and lungs are torn from chests. 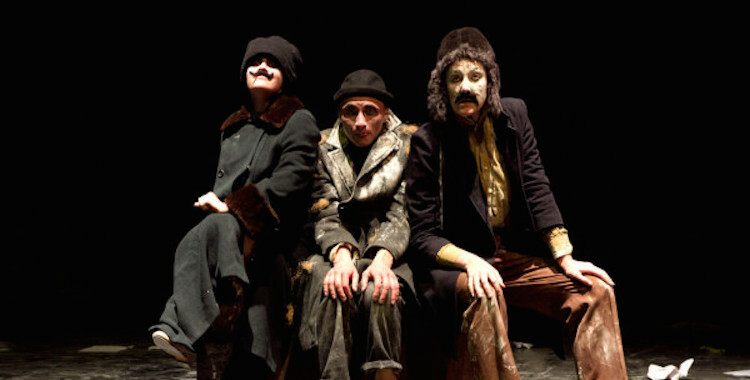 Clout Theatre’s starting point for their surreal grotesquerie on this occasion is Russian absurdist writer Daniil Kharms, who faced Soviet censorship in his lifetime and many of whose works remained unpublished until after his death. That perhaps accounts for the built in difficulties that surround Clout Theatre’s frenetic storytelling. Narrative is interrupted and confounded, the central story – Kharms’ ‘The Old Woman’ – becoming muddied or obscured. The writer loses control of his boisterous creation. As in The Various Lives of Infinite Nullity, performers Sacha Plaige, Jennifer Swingler and George Ramsay adopt clown-like personas, though here they are more playful than sinister (but not without an edge of the latter). The bouffon-esque trio seem eager to entertain us and competitive in their attempts to alternately convey and derail the narrative at hand, whether that’s by telling swirling, nonsensical anecdotes or whacking one another over the head with vegetables. This performance style could quickly become wearing, and there are moments when it briefly grates, but Clout Theatre have enough charm and ingenuity to just about pull it off. If these clowning interludes entertain with their wackiness, the narrative sequences themselves are strangely beautiful. The story of ‘The Old Woman’ – in which a writer finds his life disrupted by the mysterious figure of the title – is told through a DIY silent film aesthetic, fully exploiting the elastic expressivity of Clout Theatre’s performers. Ramsay in particular manages to access the full emotional range with just his impressively flexible facial muscles, while Plaige contorts herself into an extraordinary array of positions. If theatre were solely about isolated stage images, Clout Theatre would be some of the best artists around. Startling snapshot follows startling snapshot. A creature formed of screwed-up paper stirs in the corner of a writer’s office; a recalcitrant corpse is frantically bundled into a suitcase; bodies wrestle and writhe; figures suddenly appear and disappear. Music also plays an integral role, with an inspired use of Shostakovich’s String Quartet No. 8. But the same reservations that I had about The Various Lives of Infinite Nullityalso apply to How a Man Crumbled. Both shows are brilliant vehicles for the (clearly abundant) skills of their performers, yet I can’t fight the feeling that there’s something missing. The aesthetic is there, but the purpose and drive behind the succession of striking images is not quite apparent. Like the writer they show frustratedly scribbling on page after page, Clout Theatre seem to be grasping at something just out of reach.